Sometimes, a straight tipper is best. At others, a hookloader. So which to have? For Fuller Grab Hire of Smallfield, Surrey, the answer they wanted was as near as possible to ‘Both’. What makes their new truck particularly interesting is its combination of the latest Hyva TITAN hookloader with one of Thompsons low sided Wastemaster demountable bodies. Both recently introduced products, each is notable for offering the lowest weight and highest performance in their class. Bringing them together into a single combination therefore results in exceptional operating advantages. “We wanted a vehicle that could simply do more” says company owner Matt Fuller “so we specified it with particular care. In terms of its overall features, Hyva’s TITAN quickly stood out from the rest as being the most modern, highly specified and easiest to operate – and besides that, you see Hyva hookloaders everywhere. 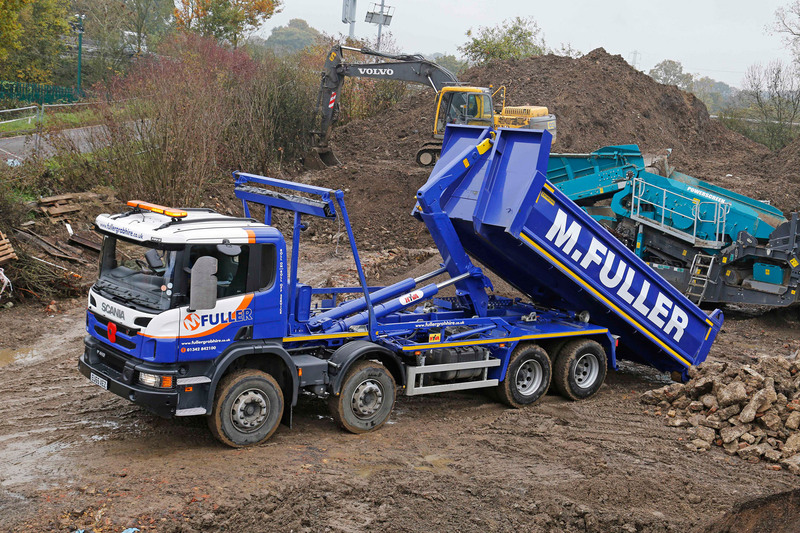 Whereas most hookloaders are bought solely for high volume waste disposal work, Fuller’s truck with its Wastemaster body can easily double up as a standard tipper employed on anything from muckaway and site work to delivering aggregates. Whilst its payload might be reduced over that of a conventional tipper, the much larger bonus is that this truck can also operate in other environments that a standard tipper cannot. “In today’s world, a small but growing fleet has to be as versatile as possible” says Matt Fuller. “We can’t ever be put in a position where we’d have to turn a job down because we don’t have the right type of vehicle. We’re an expanding business, and fundamental to that is saying ‘Yes’ to whatever work comes along. Making new vehicle acquisition as easy as possible for UK operators, Thompsons also supplies and fits Hyva hookloader and skiploader bodywork at its factories in Croydon and Blackburn. Finished vehicles are then delivered to customers fully painted, tested and ready for work.